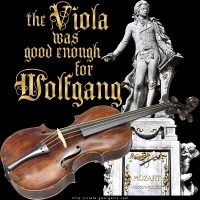 “The Viola was good enough for Wolfgang” is the caption on this image of a statue of composer Wolfgang Amadeus Mozart, to which we’ve added a viola and bow. Makes a great gift for that special violist or lover of Mozart’s music and the viola! Buy this design now on any t-shirt, hoodie, tote bag, mousepad, mug or other quality giftware and apparel, exclusively from Bratsche’s Viola Bazaar!